Curator Richard Blurton tells the story behind an exciting new acquisition – a sitar owned and played by the great Indian musician Ravi Shankar. One of the striking features of cultural life in the 20th century has been the way in which the performative traditions of South Asia (the area covering the modern countries of Pakistan, India, Nepal, Bangladesh, Bhutan and Sri Lanka) have become known outside the subcontinent, and indeed throughout the world. Sitar of Pandit Ravi Shankar (1920–2012). Commissioned by Shankar from the instrument maker Nodu Mullick in Calcutta. Made in 1961. A recent very generous gift of a sitar to the Museum has enabled us to dramatically demonstrate this in the newly refurbished Sir Joseph Hotung Gallery of China and South Asia. The new gallery takes a chronological approach, starting with the first tools of near humans from about 1.5 million years ago, and ending with contemporary South Asia – the latest item is a 2008 installation by the Bangladeshi artist Naeem Mohaieman. Among these last displays is a case demonstrating the remarkable internationalisation of Indian culture – film, dance and especially music. The sitar now on display in Room 33 is particularly special. It was made for the great musician Ravi Shankar (1920–2012) in 1961 by the Calcutta-based instrument maker Nodu Mullick. Mullick made four sitars for Shankar, and we believe this to be the first of the group. The neck and sounding board are made of teak, while the bulbous resonator is a gourd (a second, smaller, removable gourd resonator is at the top of the neck). The metal strings are tensioned across the neck and the belly, and are kept taut by pegs in the neck. The neck is decorated with stained and inlaid bone, and the belly with laid-on patterning in wood of vegetal scrolling. 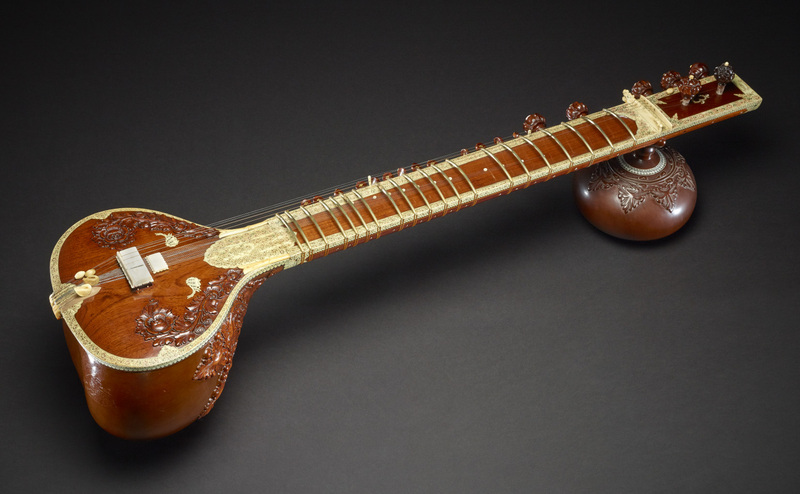 Other examples of Indian musical instruments exist in the Museum’s collection, though none are as beautifully decorated or so connected to a cultural figure of the stature of Pandit Ravi Shankar. Ravi Shankar spent his whole life presenting the artistic traditions of his own country to the rest of the world. Initially he did this through participation in the dance troupe of his elder brother, Uday Shankar, but in his late teens, he gave up dancing in favour of music and above all, the sitar. He came from a family of Bengali origin though he was born in Benares (now Varanasi) in northern India, in 1920. His elder brother, Uday, was a well-known dancer who both studied and performed in London – incredibly he worked with Anna Pavlova, their piece de resistance, a pas de deux: Radha-Krishna. Uday is known to have visited the British Museum to study Indian medieval sculpture to enable him to better understand how to develop his new Indian dance. The wonderful gift of the sitar is therefore just the latest chapter in the history of connections between the Shankar family and the Museum. The gift has come from Sukanya Shankar, the widow of Ravi Shankar, their daughter Anoushka Shankar and the Ravi Shankar Foundation. Anoushka is also herself a renowned sitar player, both following in the footsteps of her father but also striking out on her own path of musical expression and discovery. The Museum is also most grateful to Nasreen Munni Kabir for her help with this project. 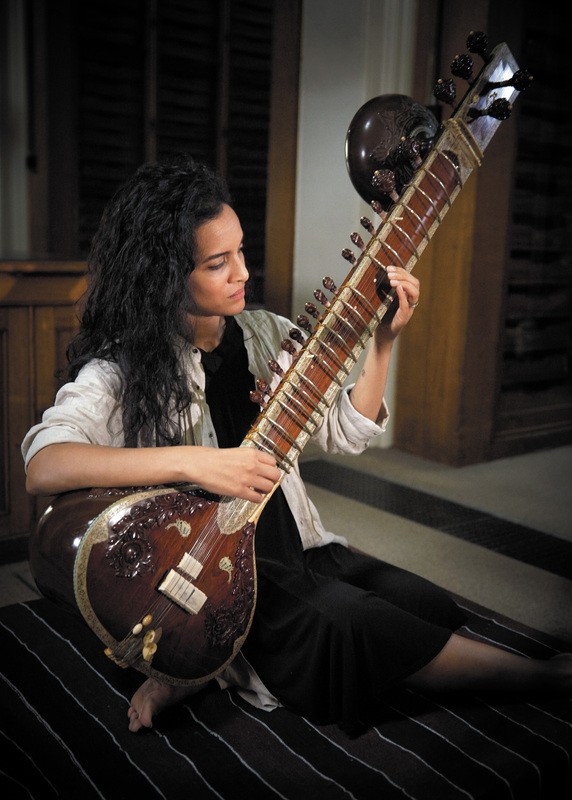 Anoushka Shankar playing Ravi Shankar’s sitar in the Museum. Ravi Shankar’s great genius was his openness to other traditions. He was so confidently grounded in his own tradition that he felt unthreatened and completely secure in both presenting it to the world, but also engaging with other traditions in a wonderfully open and collaborative way. This, of course, is most remembered in his teaching of, and collaboration with the Beatles, above all George Harrison. He also worked with jazz and classical musicians, famously with the violinist Yehudi Menuhin. He was an ambassador for transcultural activity of the most profound and spontaneous variety. The gift of the sitar to the Museum enables us to tell both the human story of Ravi Shankar’s life and work, both in the west and in India, but also to place him, and other cultural ambassadors, within the context of the discovery of the cultural achievements of the entire world. This an endeavour that lies at the very heart of the British Museum’s mission in the 21st century. You can see this remarkable sitar on display in the Sir Joseph Hotung Gallery of China and South Asia.